Xiaomi’s new flagship model, Mi Mix 3, the successor to last year’s Mi Mix 2, is being talked about since July this year but now some authentic leaks have somewhat confirmed (not officially by the company itself though) that the phone may be launched this October itself. 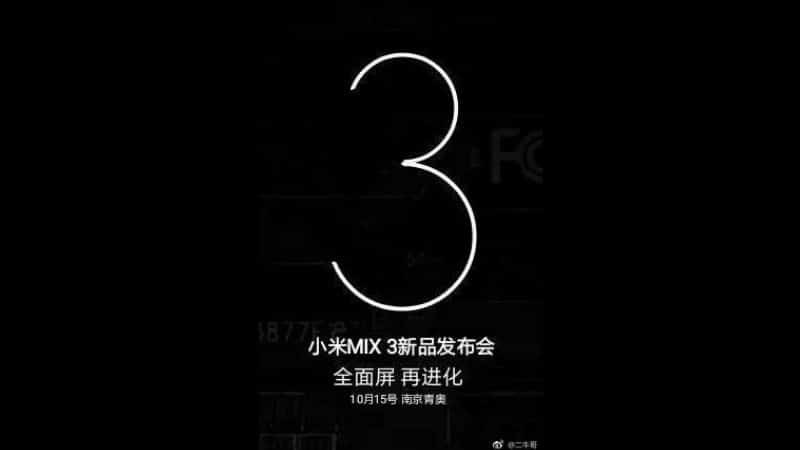 A leaked poster teasing the Mi Mix 3 has surfaced on Weibo. The poster which you can see above, tells about the Xiaomi event this October 15, taking place at the Nanjing Olympics Sports Centre, in China. Earlier too, it was speculated that the device was going to be launched last month, on September 15, which couldn’t happen eventually. Xiaomi President Lin Bin had also previously confirmed a launch event in October and now the new leaks imply that this launch event may be regarding the Mi Mix 3 only. As per the rumors, the phone will also have a camera slider, just like this year’s early revolutionary phone, Oppo’s Find X. Although, Find X had a motorized slider, the Mi Mix 3 will be having a manual slider instead. The display may be a Samsung’s QHD+ AMOLED panel, with COP packaging technology. The performance will be fastened by the latest Snapdragon 845 chipset and for selfies, there may be a 20MP front sensor. When it comes to pricing, it’s still not known about what will be the exact details, but again, the predictions say that the phone will be coming in four variants. The 6GB/64GB model may be priced for about $510 (Rs. 36,300), 6GB/128GB model for $555 (Rs. 39,500), and 8GB/128GB model for $600 (Rs. 42,700). Apart from these variants, there will also be an 8GB/256GB model which may be priced at around $645 (45,900). The official news may be announced soon regarding the event as October 15 is just around the corner. Xiaomi has become a hot brand these days and whatever new device they announce, becomes a popular one among the customers, because they know that Xiaomi offers the premium specs in a limited budget. For an overview, you can watch a concept video of the phone itself-just a concept, not official.